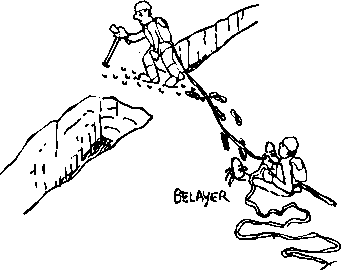 Note: I discourage beginning climbers from using this method of ascent without the presence of an experienced climber; as the switch from ascending to descending (rappelling) poses some potential dangers. I discuss it here only to allow the reader to see how it works. Blake's Hitch currently being used to climb. Blake's Hitch on the other end of the same rope ready for use on the next anchor. In this type of ascent, the rope is put over the limb, a loop is tied into the end using a Figure-eight on a Bight but with a short tail this time for an overhand backup knot. A locking carabiner is clipped through this loop and around the standing part of the rope or a bowline on a bight is tied around the standing part. The standing part is then hauled down on, pulling the carabiner (or a bowline on a bight) up to the limb. You now have a single rope whose end is secured to the limb. Attach your top ascender (the one without foot loops) to the rope and slide it up as far as possible. Then, pulling down on the rope, hop up and slide the ascender as far up as possible. This will remove some of the stretch from the rope so that you are not sitting on the ground. Your weight should be on the rope, and you should be sitting in your saddle at this point. Now attach the bottom ascender to the rope and insert your feet into the foot loops. Stand in the foot loops and slide your top ascender up as far as possible. Sit in your saddle and slide your bottom ascender up a foot or so. Repeat as necessaiy until you reach your anchor. Cautionary note - don't slide your top ascender up tight against the carabiner at your anchor, leave two or three inches. Sometimes the ascender needs to be slid up the rope slightly to release it and if it is tight against the carabiner, creates a problem. recreational climbing done in the western states where the trees are truly huge. It is used frequently in the rest of the country as well. I frequently use both techniques in a single tree, using the SRT to get to the first limb (which is frequently quite high) since it is more efficient. Then switching to double rope technique once I am in the canopy simply because it is a more versatile technique. How to attach a single rope to a tree?